I've always loved hiking and the outdoors so my work is based in the natural world—landscapes, seascapes, and macro/close-ups of flowers, leaves, rocks, and driftwood, as well as abstracts created from my macro images. I live in the town of Cottonwood near Sedona, Arizona and I’m amazed at the stunning beauty of the Red Rock Country area as well as the surrounding southwest region. One of the definitions of the word “sacred” is "worthy of or regarded with reverence, awe, or respect.” In this sense, I consider these beautiful natural areas as sacred ground. I feel a strong spiritual connection to the land so my artwork comes from a place of profound reverence and appreciation for this beautiful planet Earth. My images are pure nature in the style of a photorealistic painting with vibrant colors. I normally use a very wide angle lens and stitch multiple images together to create large panoramic landscapes so I can capture the entire spacious scene that I find so awe inspiring. Most of my landscapes are available in sizes up to 96” x 48” (8 feet x 4 feet). Several years ago, I started experimenting with digital artistic effects, looking for a way to create more artistically expressive images. I had this vision in my head and I was never satisfied with simple individual filter effects. So, after a great deal of trial and error, I developed a process using several filter effects and image adjustments applied multiple times. I use several photo editing programs and normally spend many hours on the computer perfecting each image. I consider myself a photographic artist—my primary intention is always to create something beautiful and uplifting, and to communicate my feeling of awe and wonder when I explore and photograph the incredible spacious beauty of the natural world. I grew up in southern California (mostly in the San Diego area) during the 60s and 70s surfing the waves and exploring the beaches, mountains, and canyons. My dad was into scuba diving and camping so I developed an appreciation and love of the ocean and the outdoors at an early age. When other kids went to the playground or baseball field, I headed for the nearest beach to go surfing or open countryside and canyons to go exploring. My dad was also into photography—home movies and slide shows (mostly of us kids and our family adventures). Then I took a photography class in junior high and I've been hooked ever since. Working with my dad, we built a darkroom in a corner of our garage so I could develop and print black and white photos. At first I became obsessed with shooting everything I saw around me wherever I went, but then I started to narrow my focus on nature—scenic landscapes and macro/close-ups of flowers, leaves, and rock textures. My dad taught me how to scuba dive and for a time I was very interested in underwater photography (although very few of those images have survived the intervening years). By the time I graduated high school (1974), photography was in my blood. I was accepted at Brooks Institute School of Photographic Art and Science (in Santa Barbara, CA) and began my studies the following year. While there, I was very much inspired and influenced by the work of Ansel Adams (in particular, his portrayal and love of Yosemite) and Edward Weston (especially his work at Point Lobos, CA). I completed my BA degree in photography at Brooks in 1978 (when digital photography was still just an experiment in a Kodak lab), but by the time I graduated I realized that I was a lot more interested in the art of photography than the business of photography. So, to pay the bills, I went to work in residential construction with my brother and dad for about 4 years until I decided to pursue my other passion, aviation and a desire to serve my country. I joined the U.S. Air Force and spent 20 years as a combat search and rescue (CSAR) navigator which also gave me the opportunity to travel and see many parts of the U.S. and Europe. While in the Air Force, I was stationed in numerous places including Florida, New Mexico, Virginia, North Carolina, Aizona, Washington, Colorado, United Kingdom, Turkey, Italy, Norway, Iceland, and Germany. During those years I never lost my love for photography. Inspired by outdoor photographers like David Muench, Peter Lik, and Galen Rowell (and “Outdoor Photographer” magazine) I continued taking photos, studying, experimenting, and slowly improving my skills in my spare time. After I retired from the Air Force I went back into residential construction for about 6 years until I injured my back and had to quit doing that kind of heavy physical work. The good news is that I was then able to dive back into photography full time—digital photography in particular. I always felt constrained by the limitations of film photography so I was very excited when digital photography matured and evolved beyond the limitations of film. I was very happy to get away from the stinky, toxic chemicals of film photography. I love the control and creative freedom that digital photography provides. My wife and I moved to Maine and lived there for about 10 years and during that time I developed a keen interest in using very wide angle lenses and stitching multiple images together to create panoramic landscapes. I was never quite satisfied with single images—they felt incomplete to me and I wanted to capture the entire spacious scene that I found to be so awe inspiring. At the same time, I began using various high dynamic range (HDR) software to capture all the beautiful details that had previously been hidden in the bright clouds or dark shadows—to create an image that is more natural looking and more closely matches what the human eye sees. Then, several years ago, I started experimenting with digital artistic effects, looking for a way to create more artistically expressive images. I had this vision in my head and I was never satisfied with simple individual filter effects. So, after a great deal of trial and error, I developed a process using several filter effects and image adjustments applied multiple times. I normally spend many hours on the computer perfecting each image. I use high quality lenses and a high resolution digital camera. As a consequence, combined with stitching multiple images together, and as an interesting side effect of the digital artistic effect, I'm able to offer very large prints—many of my panoramic landscapes are available in sizes up to 96” x 48” (8 feet x 4 feet). I also enjoy creating artistic abstract images from my macro and close-up photos of leaves, rocks, and driftwood. Because my wife is a quilt and fiber artist, I got interested in using my abstract images for fabric design and you can see my fabrics online at Spoonflower. I consider myself a photographic artist—my primary intention is always to create something beautiful and uplifting, and to communicate my feeling of awe and wonder when I explore and photograph the incredible spacious beauty of the natural world. 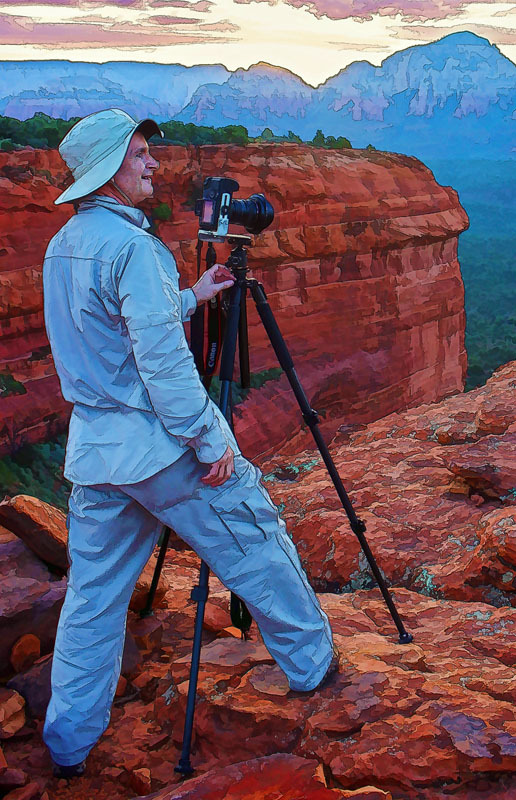 A couple of years ago we moved to Cottonwood, Arizona (near Sedona) and I'm having a wonderful time exploring and photographing the stunning beauty of the Red Rock Country area as well as the surrounding southwest region. I especially love the incredible rock formations and trees of this area. From the moment I started hiking and exploring these areas, I felt a strong spiritual connection to the land. One of the definitions of the word sacred is "worthy of or regarded with reverence, awe, or respect.” In this sense, I consider these beautiful natural areas as sacred ground. So my artwork comes from a place of profound reverence and appreciation for this beautiful planet Earth.